At the end of 2011, Minister for Finance, Michael Noonan wrote to the National Treasury Management Agency asking that staff earning in excess of €200,000 would waive 15% of their salaries in 2012 or the portion of their salaries over €200,000 whichever was the lesser. The NTMA which is the umbrella organisation for a number of organisations including NAMA eventually complied with the request and all staff earning more than €200,000 have seen 15% of their salaries waived in 2012 (or the excess over €200,000 whichever is the lesser). Minister Noonan is the sole shareholder in IBRC and controls 100% of the shares. At the end of 2011, these were the salaries and associated staff. 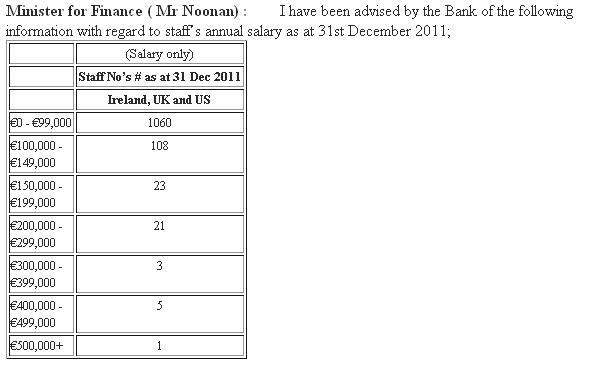 So Brendan McDonagh at NAMA took a cut of 15% to his €430,000 salary as requested and now earns €365,500. All other staff at NAMA earning more than €200,000 waived 15% of their salaries. said “No”. 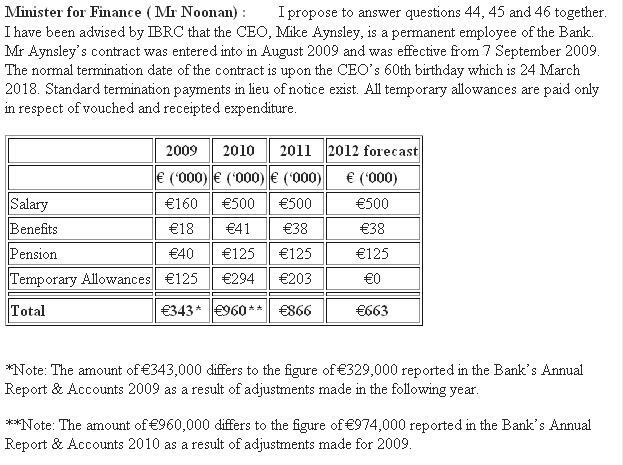 Not only that but 29 other staff whose salary is in excess of €200,000 also said “no”. Staff at NAMA who sacrificed their salaries would be justified in feeling they are bearing an unfair share of burdens. NAMA manages an overall portfolio of loans worth about 30% more than those managed at IBRC, and arguably NAMA has a much more higher profile and challenging task. But whilst NAMA staff might feel aggrieved at the apparent discrimination towards their efforts, the rest of us will be justified in yet again being flabbergasted at the ignorance and insensitivity of bankers at IBRC. 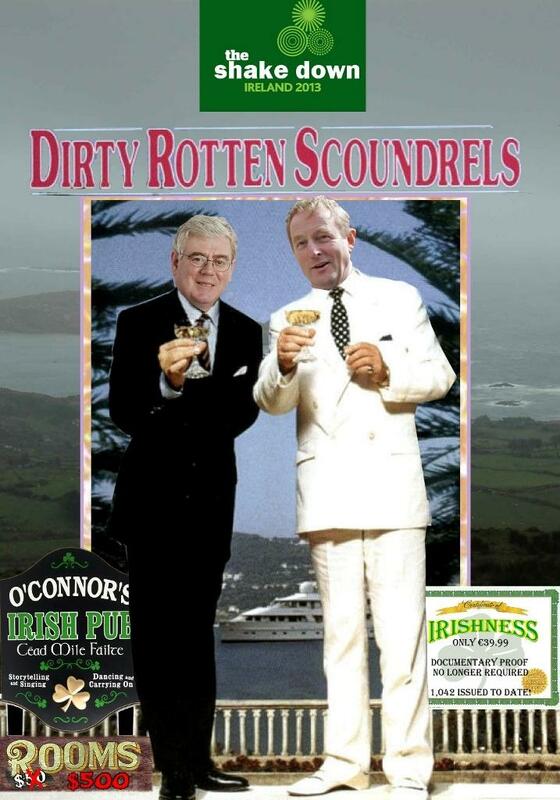 And the impotence of our finance minister who 100% owns IBRC. Deputy Pearse Doherty:To ask the Minister for Finance to provide in tabular form, with respect to the Irish Bank Resolution Corporation, the number of the staff whose annual salary at 31 December 2011 fell in the following bands, €400,000 and above, €300,000 to €399,999, €200,000 to €299,999 and €150,000 to €199,999..
Deputy Pearse Doherty:To ask the Minister for Finance to confirm the salary paid to the Chief Executive Officer of the Irish Bank Resolution Corporation Mr MikeAynsley and to provide a listing and quantification of any additional benefits paid, and in respect of any expenses allowance to confirm if such allowances are paid only in respect of vouched and receipted expenditure..
Deputy Pearse Doherty: To ask the Minister for Finance if he will confirm if the Chief Executive Officer of the Irish Bank Resolution Corporation Mr Mike Aynsley is employed on a temporary contract; the date on which this contract was entered into; the termination date of this contract and if he will quantify any termination payments provided for under the contract..
Deputy Pearse Doherty: To ask the Minister for Finance if the Chief Executive Officer of the Irish Bank Resolution Corporation Mr Mike Aynsley is employed on a continuing or permanent contract and if he will quantify any termination payments provided for under the contract. Minister for Finance, Michael Noonan: I propose to answer questions 44, 45 and 46 together. I have been advised by IBRC that the CEO, Mike Aynsley, is a permanent employee of the Bank. Mr Aynsley’s contract was entered into in August 2009 and was effective from 7 September 2009. The normal termination date of the contract is upon the CEO’s 60th birthday which is 24 March 2018. Standard termination payments in lieu of notice exist. All temporary allowances are paid only in respect of vouched and receipted expenditure. *Note: The amount of €343,000 differs to the figure of €329,000 reported in the Bank’s Annual Report & Accounts 2009 as a result of adjustments made in the following year. **Note: The amount of €960,000 differs to the figure of €974,000 reported in the Bank’s Annual Report & Accounts 2010 as a result of adjustments made for 2009. Deputy Pearse Doherty: To ask the Minister for Finance if he has contacted the Irish Bank Resolution Corporation requesting staff whose annual salary is in excess of €200,000 to waive 15% of their salary or such amount in excess of €200,000 whichever is the lesser, and if he has, the date on which he first made this contact; the number of staff whose annual salaries were in excess of €200,000 at that date; the number of staff who acquiesced to the request for the waiver; the number of staff who refused the request for the waiver and the number of staff who have not responded to the request for the waiver..
Minister for Finance, Michael Noonan: At a meeting on the 5th April 2012, I asked the Chairman of IBRC, Mr Alan Dukes, if the Board of the Bank would consider a reduction of 15% in senior management salaries. Mr Dukes subsequently informed me that reductions in pay levels for individual staff in IBRC, (the entity tasked with winding down the former Anglo Irish Bank and INBS), had been considered by the Board of the Bank and that a decision had been reached not to implement cuts at that time. I am informed by the Bank that the decision not to pursue pay cuts was based on the difficulty faced by the Bank in retaining and attracting staff, and the fact that the remuneration packages paid to the new management team are lower than those historically paid by the Bank. Fees however for Non-Executive Directors were initially reduced by 20% at the end of 2008 and by a further 15% in July of 2012. With each passing week, the evidence mounts that Minister for Finance Michael Noonan is clueless about the banking responsibilities part of his remit. In September 2012 he tried to defend his failure to merge NAMA with what remains of Anglo and Irish Nationwide – now merged into the Irish Bank Resolution Corporation, IBRC – by claiming that NAMA didn’t compete with IBRC “for customers and resources” This is patent rubbish as NAMA and IBRC are both working out legacy loans, mostly based on property lending, both are set to run down their operations by 2020. 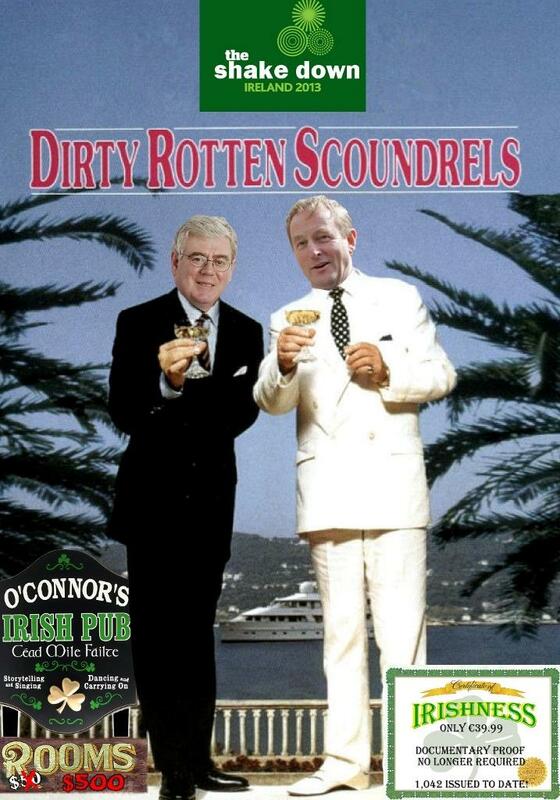 NAMA and IBRC compete for customers. If IBRC is selling a loan portfolio secured by property assets then it is talking to the same potential buyers to which NAMA is talking. So potential buyers get to play the two state-owned institutions off against one another, and this cash-strapped State gets to double its spend on marketing and sales costs. Today we learn that NAMA has recruited 14 staff directly from IBRC. Minister Noonan was responding to a question from the Sinn Fein finance spokesperson Pearse Doherty and said that of the 227 staff now employed by NAMA, 14 came from IBRC and its predecessors, Anglo and Irish Nationwide Building Society. It was revealed last month that NAMA spends about €500,000 on recruitment fees. So we have the fact that NAMA is recruiting staff from IBRC, we have the fact that IBRC is complaining about retaining staff amid competition, including competition from State-entities and we even have NAMA spending large sums of money on recruitment. And you have the fact of Minister Noonan valiantly claiming there is no competition between NAMA and IBRC. Deputy Pearse Doherty: To ask the Minister for Finance further to parliamentary Question No. 311 of 18 September 2012, the number of staff recruited by the National Assets Management Agency, via the legal entity the National Treasury Management Agency, whose immediately prior employer was Irish Bank Resolution Corporation..
Minister for Finance, Michael Noonan: The National Asset Management Agency informs me that since its inception it has, through the National Treasury Management Agency, recruited 227 staff, 14 of whom have been recruited directly from the Irish Bank Resolution Corporation or its predecessor entities. Despite NAMA’s extensive engagement at an official and commercial level in Northern Ireland, it remains exposed to accusations from all quarters that it is damaging the local economy. Today, NAMA is in the firing line from a disgruntled operator of a petrol station in Antrim town in county Antrim. British supermarket giant Asda already anchors the Junction One shopping outlet centre and wants to buy an adjacent petrol station which it is believed is owned by the Kennedy Group whose loans are now in NAMA. If Asda acquires a filling station, then in line with the supermarket’s pricing policy elsewhere in the UK, motorists might expect to pay 12c a litre less than standard for their motor fuel. However NAMA is reported to have said that it need place the filling station property on the open market to ensure it gets the best deal for the taxpayer and that has infuriated the petrol station operator, identified as Paul Simpson, who complains to the local newspaper, The Antrim Guardian “we had to run the deal past NAMA and after seven or eight weeks they came back and said it was a ‘no’..they said the station would have to be put on the open market for a number of months to ensure that this was the market price, even though Asda were offering above the odds.” The newspaper goes on to quote Paul saying NAMA “is holding a gun to the head of Antrim motorists” by not doing a deal with Asda. NAMA will no doubt say that it has a duty to ensure that it achieves the best price for all property under its control and that it is the open market that determines the “going rate” and that it won’t be bounced into transactions by someone with a vested interest making a bee-line to the local newspaper. It took at least four decades for Ireland to finally get a residential property price register which was launched on 30th September 2012, after a register was called for in the Kenny Report in 1973/4. Given the post-1974 political lip-service paid by politicians to the register – mostly whilst said politicians were in Opposition – the delay was astounding. Politicians just don’t want transparency in this country and were it not for the IMF prodding the Government with a financial assistance stick, then we probably wouldn’t have a residential price register today. By the way, Minister Shatter has ruled out extending the register to pre-2010 transactions – transparency has its limits. Yesterday Minister Shatter confirmed that the other requirement pushed for by the IMF, the commercial leases register, would be published by 31st March 2013. This register will show details of leases for commercial property including the rent, and the rationale for making these details public is that it is hoped the details will improve competitiveness with tenants and landlords able to see “going rates” and act accordingly. Minister Noonan was responding to a question from the Sinn Fein finance spokesperson Pearse Doherty. It is unclear why it is taking so long for Minister Shatter to get this commercial lease register up and running. He has known that it was required since he came into office in March 2011. Minister Shatter’s reputation in Irish commercial property took a hammering last year when he dithered over reforms to commercial leases and Upward Only Rent Review terms, and eventually after nine months of dithering, hid behind finance minister, Michael Noonan’s skirt in the Dail when Minister Noonan announced that attempts at reform were being abandoned. Deputy Pearse Doherty: To ask the Minister for Justice and Equality the date on which the commercial leases database will be made available to the public by the Property Services Regulatory Authority. Minister for Justice and Equality, Alan Shatter: The Property Services Regulatory Authority has statutory responsibility for the establishment and maintenance of a Commercial Leases Database. The Authority is currently working on the development of the database and it is anticipated that it will be launched by the end of the first quarter of 2013. The above title is deliberately false and misleading – the Minister for Finance Michael Noonan was this week asked in the national parliament of the State to provide details of the sale of €675m of assets by AIB, a bank that we now own 99.8% – and the answer to a series of questions was “that would be an operational matter” and with the exception of one interesting snippet – the buyer of the assets is not regulated – the Minister is not telling us anything about the sale of assets with a nominal value of four times the State’s stake in Aer Lingus. Minister Noonan was being quizzed by the Sinn Fein finance spokesperson Pearse Doherty who asked the Minister to confirm the sale price achieved for the €675m of loans that comprised the so-called Project Kildare portfolio. You and I own 99.8% of these loans so you might have thought it was our right to know how much they fetched. Not according to Minister Noonan. Deputy Doherty asked if AIB made a loss on the sale. Again, you might have thought we had a right to know if a bank which we practically own has made a loss on what appears to be a huge transaction. Not according to Minister Noonan. By the way, industry insiders suggest an additional loss was booked on the transaction. The loans had a nominal value of €675m – actually €660m according to the Minister – and also had provisions booked by AIB against them, but it is believed AIB had to book an additional loss, over and above the provisions. So there you have it. You live in a State which can sell assets with a nominal value of €675m to an unregulated US outfit largely unknown in this country. And you can’t be told how much the assets fetched, if we made a loss on the deal and how much we paid to professionals handling the sale. Maybe we should put “Democratic” in front of “Republic of Ireland” as a nod to North Korea. Deputy Pearse Doherty: To ask the Minister for Finance further to reports that Allied Irish Banks, in which he is the shareholder of 99.8% of the shares, has sold a portfolio of loans with a nominal value of €675m to Lone Star, if he will confirm the sale price of portfolio; if AIB will book an additional loss on the sale compared with the existing book value of the loans net of provisions, and if so, the quantum of the additional loss..
Minister for Finance, Michael Noonan: The sale of loan portfolios is a commercial matter for the management and the Board of the Bank. I do not have a role in this function. AIB has informed me that EBS Limited has contracted to sell to Vesta Mortgage Investment Limited, (an affiliate of Lone Star), approximately €660m nominal of loan assets as part of its continuing strategy to meet its non-core deleveraging targets. The portfolio is primarily comprised of non-core Irish commercial real estate loans originated by EBS Limited. The sale price is a matter of confidentiality between the parties. It is normal course of practice that sales processes are conducted under appropriate confidentiality constraints in order to protect the interests of all parties. AIB is satisfied that it has maximised value for the Bank and its stakeholders as the portfolio was sold following the completion of a comprehensive two stage competitive auction sales process involving a number of credible international investors. This transaction facilitated the deleveraging of a substantial non-core portfolio and subject to completion of closing conditions is expected to close prior to year end. This sale brings AIB’s total net non-core deleveraging to date to 80% of AIB’s 3 year PLAR deleveraging target of €20.5bn. AIB remains on course to complete the majority of its total 2013 deleveraging targets by year end 2012 and to achieve this target in line with PCAR capital requirements assumed under the March 2011 exercise. Deputy Pearse Doherty: To ask the Minister for Finance further to reports that Allied Irish Banks, in which he is the shareholder of 99.8% of the shares, has sold a portfolio of loans with a nominal value of €675m to Lone Star, if he will confirm that arrangements will be made to ensure borrowers whose loans have been acquired by Lone Star, do not suffer inconvenience or loss..
€660m nominal of loan assets as part of its continuing strategy to meet its non-core deleveraging targets. The portfolio is primarily comprised of non-core Irish commercial real estate loans originated by EBS Limited. Communication with affected borrowers has been a priority for the Bank and each Borrower will receive, in addition to verbal notification, a written communication from EBS notifying them of the sale. Subsequent to completion they will also receive further written communication from EBS and separately from Vesta Mortgage Investment setting out the arrangements for the management of their loans going forward. Affected Borrowers will continue to remain liable for the full amount of their debt. Their loan terms and conditions remain unchanged and are not impacted by the sale of their loans. Deputy Pearse Doherty: To ask the Minister for Finance further to reports that Allied Irish Banks, in which the he is the shareholder of 99.8% of the shares, has sold a portfolio of loans with a nominal value of €675m to Lone Star, can he confirm the regulations that govern the relationship between Lone Star and the borrowers whose loans have been acquired.. The purchaser was selected following the completion of a comprehensive two stage competitive auction sales process involving a number of credible international investors. AIB has informed me that it is satisfied that by selecting the Purchaser following this sale process, it has maximised value for the bank and its stakeholders. This transaction was approved by the Boards of both EBS and AIB and AIB’s Deleveraging Committee which includes non-voting observers from my Department and the Central Bank. The loan terms and conditions of Borrowers whose loans form part of the sale remain unchanged and are not impacted by the sale of their loans. The Purchaser is not a regulated entity. It should be noted that this portfolio principally comprises commercial real estate loans which are not subject to the same level of regulation that applies to home loans. Deputy Pearse Doherty: To ask the Minister for Finance further to reports that Allied Irish Banks, in which he is the shareholder of 99.8% of the shares, has sold a portfolio of loans with a nominal value of €675m to Lone Star, if he will confirm the quantum of fees and commissions that AIB is paying to organisations which were engaged to assist with the sale, including fees paid to Morgan Stanley and legal fees..
Minister for Finance, Michael Noonan: The sale of loan portfolios and the appointment of advisors is a commercial matter for the management and the Board of the Bank. I do not have a role in this function. However, AIB has informed me that EBS Limited has contracted to sell to Vesta Mortgage Investment Limited, (an affiliate of Lone Star), approximately €660m nominal of loan assets as part of its continuing strategy to meet its non-core deleveraging targets. The portfolio is primarily comprised of non-core Irish commercial real estate loans originated by EBS Limited. The purchaser was selected following the completion of a comprehensive two stage competitive auction sales process involving a number of credible international investors. This transaction was approved by the Boards of both EBS and AIB and AIB’s Deleveraging Committee which includes non-voting observers from my Department and the Central Bank. AIB has further informed me that it typically engages external parties to advise it on sale processes in order to avail of relevant and necessary experience and expertise. AIB does not disclose the amounts paid to these advisors for commercial reasons. As AIB has a strong focus on minimising the costs to the bank of these expert advisors, in each case, the bank undertook a competitive tendering process to select the advisors to assist in this sale process. These processes focused on relevant experience, product knowledge, quality of advisory team and fee structure. Furthermore, in the case of the sales advisor, fees were structured to incentivise the advisor to assist in maximising value for the bank and its stakeholders. The above title is deliberately false and misleading – the Minister for Finance Michael Noonan was this week asked in the national parliament of the State to provide details of the sale of the 17% stake in NAMA owned by Irish Life/Permanent TSB – which we own 100%/99.5% – and the answer to a series of questions was “that would be an operational matter” and with the exception of one interesting snippet, the Minister is not telling us anything about the sale of a 17% stake in our biggest state agency. The one interesting snippet was that Walbrook Capital, the buyer of the 17% stake last month, was not the buyer referred to by Minister Noonan in his announcement of a sale in April 2012. Minister Noonan says “I can confirm that the transaction recently completed was not the transaction referred to in the Dail in April 2012 as a decision was subsequently taken, that Irish Life would engage a financial adviser to perform a wider marketing of the stake to Irish and international investors” Interesting that Minister Noonan didn’t reveal this in the barrage of questions on the April announcement which continued until the summer Dail recess. Minister Noonan was being quizzed by the Sinn Fein finance spokesperson Pearse Doherty who wanted to know how much a company which we practically completely own got for its 17% stake in NAMA which was bought for €17m in 2010. He was practically told to “get lost” – not only does Minister Noonan claim the amount paid was commercially sensitive, but he also claims the costs incurred by our company – Irish Life/Permanent TSB – are also commercially sensitive though we are told that Davy Corporate Finance was engaged on the deal. Minister Noonan refuses to say if Irish Life/Permanent TSB has any retained any liability in the stake, for example, if it has to compensate the buyer, Walbrook Capital, if certain dividends aren’t paid by NAMA. Minister Noonan was asked to provide the terms that apply to the 17% stake, how dividends are determined and how the final value of the stake is evaluated when NAMA is eventually wound down. The response was to refer to the NAMA Annual Report* which merely says the maximum annual dividend is capped at the rate on the 10 year Irish government bond – presumably that is the current 8-year bond – and that the final return is determined by the Articles of Association of National Asset Management Agency Investment Limited which are presently being obtained. Deputy Pearse Doherty: To ask the Minister for Finance further to his announcement on 23 April 2012 that the 17% stake in the National Asset Management Agency, or specifically National Asset Management Agency Investment Limited, owned by what was Irish Life and Permanent in the residue of which, the Minister controls 99.5% of Permanent TSB and 100% of Irish Life was sold; if he will confirm that the party to whom his April 2012 announcement related was the same as the party whom NAMA announced was its new stakeholder in October 2012. Deputy Pearse Doherty: To ask the Minister for Finance to confirm the actual sale price of the 17% stake in the National Asset Management Agency, or specifically National Asset Management Agency Investment Limited, owned by what was Irish Life and Permanent, which had a nominal value of €17m, and whether Irish Life booked any loss in its accounts on the transaction; in addition if Irish Life has retained any exposure on the stake after the sale, including a commitment to buy-back the stake or to guarantee a minimum return to the buyer..
Deputy Pearse Doherty: To ask the Minister for Finance further to the announcement of the sale of the 17% stake in the National Asset Management Agency, or specifically National Asset Management Agency Investment Limited, owned by what was Irish Life and Permanent, the sales process undertaken by Irish Life so as to secure the best deal for the taxpayer..
Deputy Pearse Doherty: To ask the Minister for Finance further to the announcement of the sale of the 17% stake in the National Asset Management Agency, or specifically National Asset Management Agency Investment Limited, owned by what was Irish Life and Permanent in the residue of which, the Minister controls 99.5% of Permanent TSB and 100% of Irish Life if he will confirm the costs incurred by Irish Life in selling its stake including fees paid to promoters and external providers of legal and other advice..
Deputy Pearse Doherty: To ask the Minister for Finance further to the announcement of the sale of the 17% stake in the National Asset Management Agency, or specifically National Asset Management Agency Investment Limited, owned by what was Irish Life and Permanent in the residue of which, the Minister controls 99.5% of Permanent TSB and 100% of Irish Life if he will set-out the terms of the share holding; the entitlement to dividends and the method by which any ultimate value of the stake will be determined when NAMA is wound up..
Deputy Pearse Doherty: To ask the Minister for Finance further to the announcement of the sale of the 17% stake in the National Asset Management Agency, or specifically National Asset Management Agency Investment Limited, owned by what was Irish Life and Permanent in the residue of which, the Minister controls 99.5% of Permanent TSB and 100% of Irish Life; the consideration given to acquiring the stake by the Bank of Ireland, in which the Minister controls 15% of the ordinary shares and further controls preference shares recently valued at €1.5bn..
Minister for Finance, Michael Noonan: I propose to take questions 207, 208, 209, 210, 211 and 212 together. I can confirm that the transaction recently completed was not the transaction referred to in the Dail in April 2012 as a decision was subsequently taken, that Irish Life would engage a financial adviser to perform a wider marketing of the stake to Irish and international investors. Irish Life appointed Davy Corporate Finance to run a competitive sales process which ultimately resulted in a company owned by the Partners of Walbrook Capital acquiring the 17% shareholding in NAMAIL. I am informed by Irish Life that the costs incurred by it in selling its stake in NAMAIL are commercially sensitive. Irish Life does not now retain any interest in NAMAIL. I am not in a position to disclose the consideration paid by the buyer due to contractual confidentiality restrictions. *Non-controlling interests in subsidiaries comprises ordinary share capital in subsidiaries not attributable directly or indirectly to the parent entity. In respect of the Group this represents the investment by private investors in the ordinary share capital of NAMAIL. NAMA has, along with the private investors, invested in NAMAIL. NAMA holds 49% of the issued share capital of NAMAIL and the remaining 51% of the share capital is held by private investors. Under the terms of the shareholders’ agreement between NAMA and the private investors, NAMA can exercise a veto over decisions taken by NAMAIL. Under the shareholder’s agreement, the maximum return which will be paid to the private investors by way of dividend is restricted to the 10 year Irish Government Bond Yield applying at the date of the declaration of the dividend. In addition the maximum investment return to the private investors is capped under the Articles of Association of NAMAIL. NAMA’s ability to veto decisions taken by NAMAIL restricts the ability of the private investors to control the financial and operating policies of the Group, and as a result NAMA has effective control over NAMAIL and the subsidiaries in the Group, as well as substantially all the economic benefits and risks of the Group. While the private investors are subject to the risk that NAMAIL may incur losses and the full value of their investment may not be recovered, they are not required to contribute any further capital to NAMAIL. By virtue of the control NAMA can exercise over NAMAIL, NAMA has consolidated NAMAIL and its subsidiaries, and for the purposes of recognising the non-controlling interests in the subsidiaries, the losses have been attributed to the non-controlling interest only up to its equity interest of €51 million. The National Gallery of Ireland in Dublin city centre has the builders in at the moment and as a result of the ongoing refurbishment, the best, or most well-known, of the Irish-painted works have been thrown together in one room. Each painting has a little placard giving a little information about the artist and the work. And each artist’s birth and death year is shown, as is the place of birth and place of death. What is remarkable is the number of Irish artists who died overseas. Yes, some died in Rome or in France, traditional homes of great art, but most died in London, or Exeter or the Isle of Wight. Or Poughkeepsie in New York state – hardly world-renowned for its artistic attractions. With the intense Irish weather, the brilliant skies and preponderance of rain, you might have expected more of our artists to stay, and even to attract artists from elsewhere. But this one great room in the National Gallery shows us as much about our history of emigration as it does about our art. Actor, Gabriel Byrne – star of “Bracken” where he was Dinny and Miley’s neighbour, and “The Usual Suspects” – hit the headlines this week for criticising An Taoiseach Enda Kenny’s speech launching The Gathering 2013, a speech which Gabriel claims rubbed Americans up the wrong way and which he also found hollow in light of his own experiences with the famous Irish Diaspora – emigrants and their descendants. The Gathering 2013 is primarily a tourism drive promoting Ireland to the Diaspora and inviting the Diaspora to visit the country in 2013 where a number of special events will be held, and where there will be individual “gatherings” of those with the same family surname. What seems to have gotten Gabriel’s goat is the overt commercialisation of The Gathering, the key performance indicator of which will be the hoped-for 325,000 extra tourists and their contribution to the revival of the Irish economy. And as a worker himself in the US, Gabriel has encountered that painful aspect of illegal Irish emigration – the Irish emigrant working illegally in the US, unable to return to Ireland for a funeral, christening or wedding because they would be unable to re-gain admission to the US afterwards. So Gabriel attacked The Gathering 2013 as a “scam” claiming we don’t care about our emigrants except to shake them down for a few quid. The evidence suggests Gabriel is correct. We have senior members of this Government hoping that emigration will lessen the burden on the social welfare budget and help make the unemployment figures look cosmetically better. We have Minister Noonan dismissing concerns about emigration – 87,000 in the year to April 2012 according to the Central Statistics Office or an average of 240 for each of the 365 days last year – and suggesting it is a lifestyle choice. And maybe for some it is a lifestyle choice, but it seems that lifestyle choices have altered radically since the onset of the financial and property crisis in 2007/8 when only an estimated 45,300 emigrated in the 12 months to April 2008. Irish has a painful history of emigration. And do we care about our emigrants? Officially we seem glad to see the back of them. Unless of course the nation’s finances get so dire and the local well of gombeenism runs dry, and then we have to resort to appealing to their patriotism and sense of roots. As long as they bring their cheque-books with them. Perhaps one day in the future, we might get a leader that will stand outside Dublin airport on St Stephen’s Day and apologise to those taking the planes to London, Boston and Sydney for the failure of this country to provide a space to grow up, be educated, work, have a family and a career and to grow old. And perhaps one day, we might frame a series of events that go beyond the fleecing of a few dollars by those who stayed from those who didn’t.